We propose a multi-terminal spin filter using a quantum dot with spin-orbit interaction. First, we formulate the spin Hall effect (SHE) in a quantum dot connected to three leads. We show that the SHE is significantly enhanced by the resonant tunneling if the level spacing in the quantum dot is smaller than the level broadening. We stress that the SHE is tunable by changing the tunnel coupling to the third lead. Next, we perform a numerical simulation for a multi-terminal spin filter using a quantum dot fabricated on semiconductor heterostructures. The spin filter shows an efficiency of more than 50% when the conditions for the enhanced SHE are satisfied. where U(r) is an external potential, and σ indicates the electron spin s= σ/2. The coupling constant λ is largely enhanced in narrow-gap semiconductors such as InAs, compared with the value in the vacuum . where . The Rashba SO interaction can be tuned by the external electric field, or the gate voltage [5–7]. In the spin transistor proposed by Datta and Das , electron spins are injected into the 2DEG from a ferromagnet, and manipulated by tuning the strength of Rashba SO interaction. However, the spin injection from a ferromagnetic metal to semiconductors is generally not efficient, less than 0.1%, because of the conductivity mismatch . To overcome this difficulty, the SO interaction may be useful for the spin injection into semiconductor without ferromagnets. Several spin filters were proposed utilizing the SO interaction, e.g., three-terminal devices based on the spin Hall effect (SHE) [10–12], a triple-barrier tunnel diode , a quantum point contact [14, 15], and an open quantum dot [16–19]. The SHE is one of the phenomena utilized to create a spin current in the presence of SO interaction. There are two types of SHE. One is an intrinsic SHE which creates a dissipationless spin current in the perfect crystal [20–22]. The other is an extrinsic SHE caused by the spin-dependent scattering of electrons by impurities [23–25]. In our previous articles [26–28], we have formulated the extrinsic SHE in semiconductor heterostructures with an artificial potential created by antidot, scanning tunnel microscope (STM) tip, etc. The artificial potential is electrically tunable and may be attractive as well as repulsive. We showed that the SHE is significantly enhanced by the resonant scattering when the attractive potential is properly tuned. We proposed a multi-terminal spin filter including the artificial potential, which shows an efficiency of more than 50% . 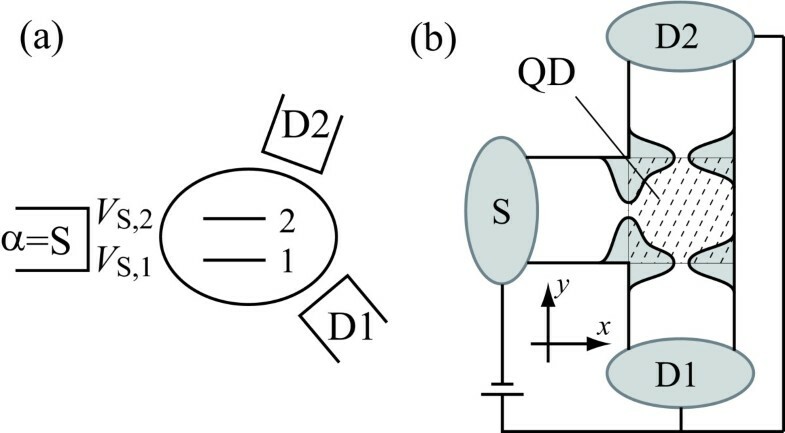 In the present article, we investigate an enhancement of the SHE by the resonant tunneling through a quantum dot (QD) with strong SO interaction, e.g., InAs QD [29–34]. The QD shows a peak structure of the current as a function of gate voltage, the so-called Coulomb oscillation. At the current peaks, the resonant tunneling takes place at low temperatures. First, we consider an impurity Anderson model with three leads, as shown in Figure 1a. There are two energy levels in the QD. We show a remarkable enhancement of the SHE when the level spacing in the QD is smaller than the level broadening. The SHE is electrically tunable by changing the tunnel coupling to the third lead. Models of a multi-terminal spin filter using a quantum dot with SO interaction. (a) Impurity Anderson model with three leads. There are two energy levels (j = 1, 2) in the quantum dot. They are connected to lead by tunnel coupling, V α,j (b) A three-terminal spin-filtering device fabricated on semiconductor heterostructures. 2DEG is confined in the xy plane. A quantum dot is formed by quantum point contacts on three leads. Reservoir S is a source from which spin-unpolarized electrons are injected into the quantum dot. The voltage is identical in reservoirs D1 and D2. Next, we perform a numerical simulation for a spin-filtering device fabricated on semiconductor heterostructures, in which a QD is connected to three leads (Figure 1b). The device is described using the tight-binding model of square lattice, which discretizes the two-dimensional space . We find that the spin filter indicates an efficiency of more than 50% when some conditions are satisfied. for spin ±1/2 in the direction of 〈2|(p× ∇ U)|1〉. 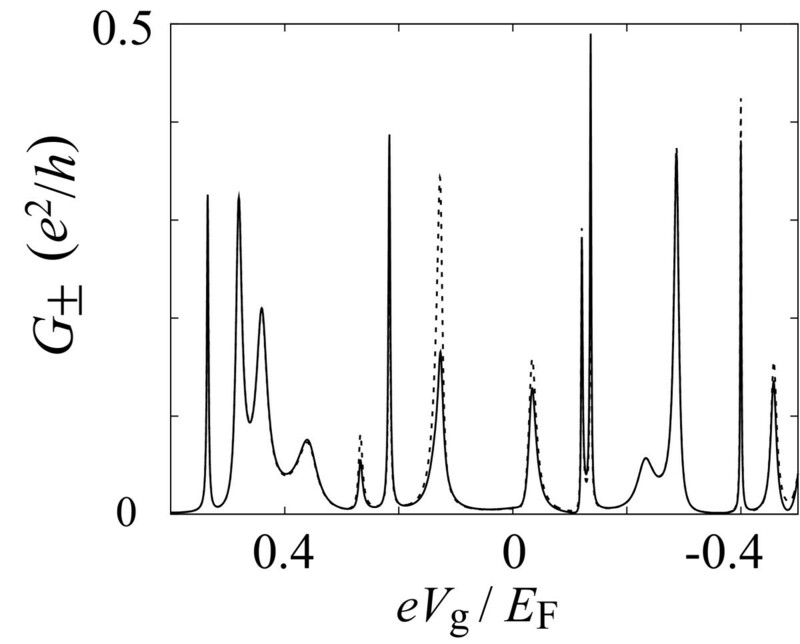 The state |j〉 in the QD is connected to lead α by tunnel coupling, V α,j (j = 1, 2). The strength of the tunnel coupling is characterized by the level broadening, Γ α = πν α (V α,1 2 + V α,2 2), where ν α is the density of states in the lead. The leads have a single channel of conduction electrons. Unpolarized electrons are injected into the QD from source lead (α = S) and output to drain leads (Dn; n = 1, 2, ⋯, N - 1). The electric voltage is identical in the (N - 1) drain leads. The current to the drain Dn of each spin component, I n,±, is generally formulated in terms of Green functions in the QD . Here, D is the determinant of the QD Green function, which is independent of spin ±1/2 (see Ref. for detail). We introduce unit vectors, e α (α = S, D1, and D2), where , in the pseudo-spin space representing levels 1 and 2 in the QD. (a× b)3 = a 1 b 2 - a 2 b 1. 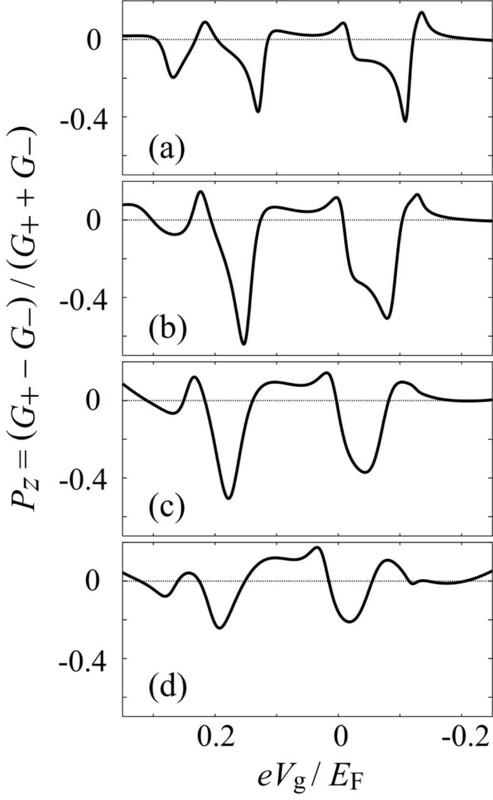 In Equation 3, the spin current [∝ (G n,+- G n,-)] stems from the interplay between SO interaction, ΔSO, and tunnel coupling to lead D2, ΓD2. We exclude specific situations in which two from e S, e D1, and e D2 are parallel to each other hereafter. We find the conditions for a large spin current as follows: (i) The level spacing, Δε = ε 2 - ε 1, is smaller than the level broadening by the tunnel coupling to leads S and D1, ΓS + ΓD1. (ii) The Fermi level in the leads is close to the energy levels in the QD (resonant condition). (iii) The level broadening by the tunnel coupling to lead D2, ΓD2, is comparable with the strength of SO interaction ΔSO. Figure 2 shows the conductance of each spin, G 1,+ (solid line) and G 1,- (broken line), as a function of ε d = (ε 1 +ε 2)/2, in the case of N = 3. The conductance shows a peak reflecting the resonant tunneling around the Fermi level in the leads, which is set to be zero. We set ΓS = ΓD1 ≡ Γ, whereas (a) ΓD2 = 0.2Γ, (b) 0.5Γ, (c) Γ, and (d) 2Γ. The level spacing in the QD is Δε = 0.2Γ. The strength of SO interaction is ΔSO = 0.2Γ. The calculated results clearly indicate that the SHE is enhanced by the resonant tunneling around the peak. We obtain a large spin current when ΓD2 ~ ΔSO, as pointed out previously. Therefore, the SHE is tunable by changing the tunnel coupling to the third lead, ΓD2. Calculated results of the conductance G 1,± to the drain 1 for spin ±1/2 in the impurity Anderson model with three leads. In the abscissa, ε d = (ε 1 + ε 2)/2, where ε 1 and ε 2 are the energy levels in the quantum dot. Solid and broken lines indicate G 1,+ and G 1,-, respectively. The level broadening by the tunnel coupling to the source and drain 1 is ΓS = ΓD1 ≡ Γ (V S,1/V S,2 = 1/2, V D1,1/VD1,2 = -3), whereas that to drain 2 is (a) ΓD2 = 0.2Γ, (b) 0.5Γ, (c) Γ, and (d) 2Γ (V D2,1/V D2,2 = 1). Δε = ε 2 - ε 1 = 0.2Γ. The strength of SO interaction is ΔSO = 0.2Γ. To confirm the enhancement of SHE discussed using a simple model, we perform a numerical simulation for a spin-filtering device in which a QD is connected to three leads, as shown in Figure 1b. 2DEG in the xy plane is formed in a semiconductor heterostructure. Reservoir S is a source from which spin-unpolarized electrons are injected into the QD. The voltage is identical in reservoirs D1 and D2. where θ(t) is a step function [θ = 1 for t > 0, and θ = 0 for t < 0], U 0 is the potential height of the saddle point. The parameter Δ characterizes the confinement in the y direction, whereas L is the thickness of the potential barrier. When the electrostatic energy in the QD is changed by the gate voltage V g, the potential is modified to U(x, y, U 0 - eV g)+eV g inside the QD region [netted square region in Figure 1b] and U(x, y, U 0) outside of the QD region (The potential in the three quantum wires is overlapped by each other inside the QD region. Thus, we cut off the potential at the diagonal lines in the netted square region in Figure 1b). Although the SO interaction is also created by the hard-wall potential at the edges of the leads, it is negligible because of a small amplitude of the wavefunction there . with . is the potential energy at the middle point between the sites (i, j) and (i + 1, j), and is that of (i, j) and (i, j + 1). We disregard the SO interaction induced by the random potential. We assume that the Fermi wavelength is λ F = W/3 = 10a. The strength of SO interaction is , which corresponds to the value for InAs, λ = 117.1 Å2, with the width of the leads W = 30a ≈ 50 nm. The Fermi energy is given by E F/t = 2 - 2 cos(k F a), with k F = 2π/λ F. The thickness of tunnel barriers is L/λ F = 2. The randomness is W ran/E F = 1, which means that the mean free path is Λ/λF ≈ 19.4. The temperature is T = 0. We focus on the transport from reservoir S to D1 and omit the superscripts (β = D1, α = S) of and P z βα . Figure 3 presents the conductance G ± for spin s z = ±1/2 as a function of the gate voltage V g on the QD. We choose U S = U D1 = U D2 = 0.9E F for the tunnel barriers. The conductance G + (solid line) and G - (broken line) reflect the resonant tunneling through discrete energy levels formed in the QD region. Around some conductance peaks, e.g., at eV g/E F ≈ 0.13 and -0.03, the difference between G + and G - is remarkably enhanced. Thus, a large spin current is observed, which implies that two energy levels are close to each other around the Fermi level there. Results of the numerical simulation for the spin-filtering device shown in Fig. 1(b). 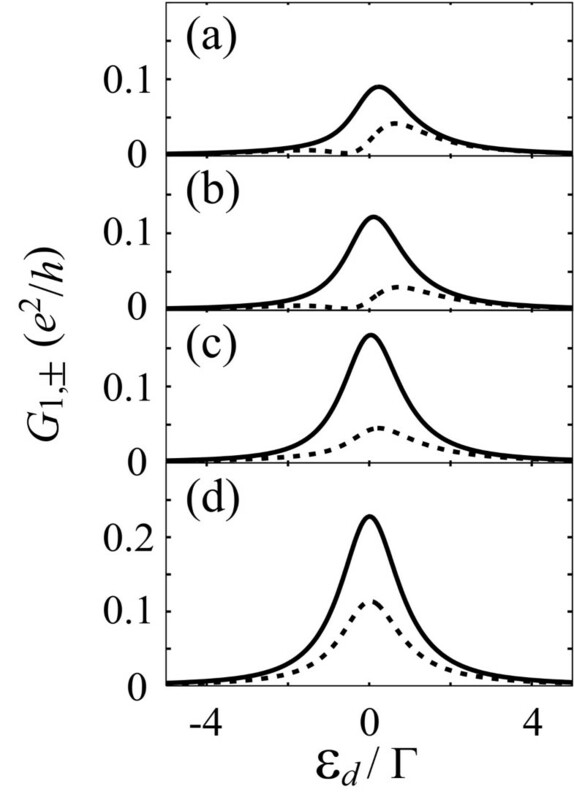 The conductance G ± for spin s z = ±1/2 from reservoir S to D1 is shown as a function of gate voltage V g on the quantum dot. Solid and broken lines indicate G + and G -, respectively. The height of the tunnel barriers is U S = U D1 = U D2 = 0.9E F.
The spin polarization P z is shown in Figure 4a for the range of 0.35 > eV g/E F > -0.25. Around the conductance peaks, a large spin polarization is observed. The efficiency of the spin filter becomes 37% at eV g/E F ≈ 0.13 and 42% at eV g/E F ≈ -0.03. Results of the numerical simulation for the spin-filtering device shown in Fig. 1b. The spin polarization P z of the output current in reservoir D1 is shown as a function of gate voltage V g on the quantum dot. The height of the tunnel barriers is U S = U D1 = 0.9E F, whereas (a) U D2/E F = 0.9, (b) 0.8, (c) 0.7, and (d) 0.6. Next, we examine the tuning of the spin filter by changing the tunnel coupling to lead D2. In Figure 4, we set (b) U D2/E F = 0.8, (c) 0.7, and (d) 0.6 while both U S and U D1 are fixed at 0.9E F. As U D2 is decreased, the tunnel coupling becomes stronger. First, the spin polarization increases with an increase in the tunnel coupling. It is as large as 63% in the case of Figure 4b. With an increase in the tunnel coupling further, the spin polarization decreases (Figure 4c,d). We have formulated the SHE in a multi-terminal QD. The SHE is enhanced by the resonant tunneling through the QD when the level spacing is smaller than the level broadening. We have shown that the SHE is tunable by changing the tunnel coupling to the third lead. Next, the numerical simulation has been performed for a spin-filtering device using a multiterminal QD fabricated on semiconductor heterostructures. The efficiency of the spin filter can be larger than 50%. This work was partly supported by a Grant-in-Aid for Scientific Research from the Japan Society for the Promotion of Science, and by Global COE Program "High-Level Global Cooperation for Leading-Edge Platform on Access Space (C12)." T. Y. is a Research Fellow of the Japan Society for the Promotion of Science. TY participated the discussion of the analytical model and carried out the numerical calculation. ME carried out the analytical formulation of spin Hall effect. All authors conceived of the study, drafted the manuscript, read and approved the final manuscript.